For the club to continue to succeed and grow new and continued volunteers are necessary and encouraged. There are volunteer opportunities for everyone regardless of how much time you can commit. Our hope is that as the club grows, families will continue to volunteer and help continue the success of the club. Please contact David Rice at president@portagesoccer.com if you would like to volunteer. The following are specific volunteer needs for the club that have been identified. Our concession stand is a great asset to the Portage Soccer Complex. In addition to enticing players and spectators with cold drinks, fresh popcorn, candy, or a cold freezer pop after a hard game, our concession stand offers a resource to both our teams and our visitors. Our volunteers offer assistance, answer questions, provide ice and assistance for injuries, and serve as a communication hub. In addition, the concession stand volunteers monitor the restrooms and pick up trash on the fields. We are continually looking for volunteers to help keep our concession windows open. We are seeking volunteers willing to learn about how the complex operates and serve as assistant coordinators for our concession stand. There is a lot of flexibility with this opportunity, as well as the opportunity to work with a variety of people and schedules. 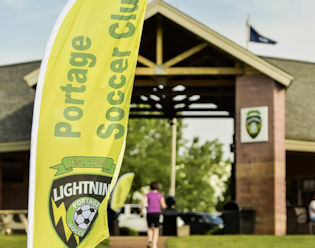 It is also a great opportunity to get to know the families within Portage Soccer Club. This could be an internship possibility for high school and/or college students, volunteer hours for high school students over the age of 16, or something that you just have a heart for. Please stop in when we are open or contact Cheryl Kucharski at concessions@portagesoccer.com if you are interested in talking about how you might be able to assist with keeping our concession stand open and running strong! With the fall soccer season underway, the PSC Soccer Ball Committee is also putting together a team to plan the 2018 PSC 4th Annual Soccer Ball Fundraiser! The PSC Soccer Ball is a fun night out for parents and a fundraiser for the PSC Scholarship Program. The goal of the PSC Scholarship Fund is to make the club soccer experience available to all qualified soccer players who have the talent and commitment, but who may not otherwise be able to afford the expense of competitive club soccer. The first three PSC Soccer Balls in 2015, 2016, & 2017 were a great success raising money for the PSC Scholarship Program. If you are interested in joining the PSC Soccer Ball Planning Committee, please contact the Fundraiser Director, Daniel Ehler, at fundraising@portagesoccer.com. The first meeting is being held the last week of September. We have a LOT of opportunities for your talents to be used - The more volunteers, the better time we all have working together.